Life's Journey To Perfection: LDS Sharing Time Ideas for May 2015 week 3: When I am baptized I make a covenant with God. May 2015 Scripture: “We believe that the first principles and ordinances of the Gospel are: first, Faith in the Lord Jesus Christ; second, Repentance; third, Baptism by immersion for the remission of sins; fourth, Laying on of hands for the gift of the Holy Ghost” (Articles of Faith 1:4). May Week 3 Topic: When I am baptized I make a covenant with God. Begin sharing time by showing the pictures of a girl and a boy getting baptized. Picture links here: Girl, Boy. Invite the children to share what is happening in the pictures. Show the children the Week theme poster (See above) Invite them to read the poster or repeat it with you. Explain that their is a word missing. Invite the primary children to tell you what word is missing. Place the word strip Baptized on the blank. Have the children read it with you again. Ask the children in they know what a covenant is? Thank them for their answers. Invite a primary child up to the front of the room. Say to that child, "I promise to give you a sticker, if you sing all of the songs during sharing time." Ask the child if they promise to sing all of the songs. If they agree. Explain to the children that a covenant is a two way promise. Explain that when we are baptized we make a covenant with Heavenly Father. 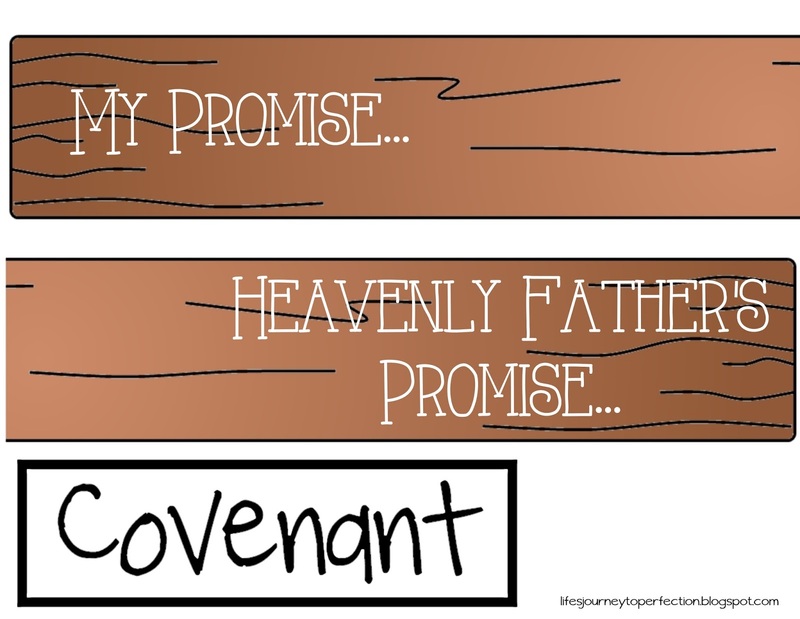 Show the children the word strip that says, "My Promise" and place it on the board. Explain that we make a promise to Heavenly Father when we are baptized. Place the word strip on the board that says, "Heavenly Father Promises". Explain that in return Heavenly Father also make a promise with us. Place the word strip "Covenant" in the middle holding the two promises together. 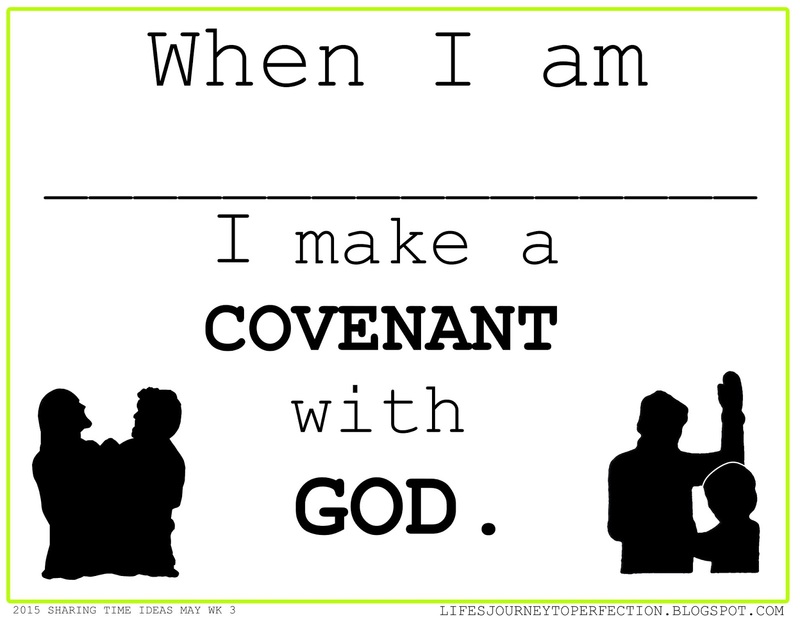 Explain that with a covenant both sides need to keep their promise or the covenant is broken. So if (primary child who made singing promise) does not keep her/his promise to sing, then I do not have to keep my promise to give them a sticker. Same with our baptism covenant. If we do not keep our promises than Heavenly Father does not need to keep His. But if we slip and don't keep our promise, we can repent and renew that covenant each week by partaking of the Sacrament. 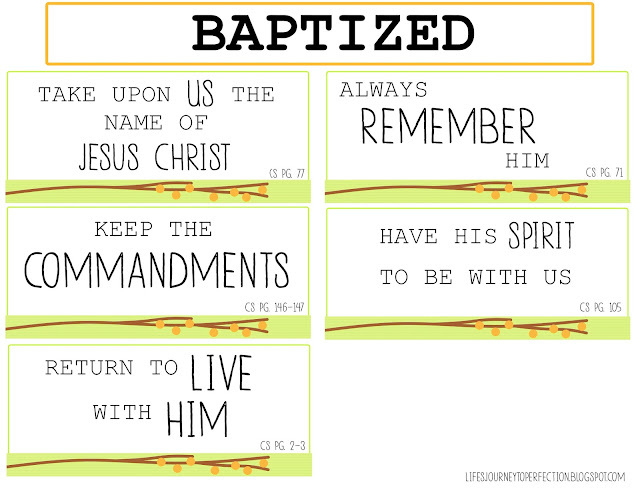 Share your testimony about baptismal covenants. Thank you for sharing! It is such a help for me! You do such wonderful work! I love what you did with this lesson. Exactly what I was searching for to help explain how covenants work! Perfect as usual, thanks Kim! This is fantastic! Explains things so perfectly and simply. Thanks so much!